When architect David Reich, who was dealing with a medical condition that limited his mobility, went looking for a handrail to install in his home to ease his mobility challenge his search for a sturdy and attractive solution proved fruitless. There was simply nothing on the market that combined strength and beauty with ease of installation. In the end his project took 6 months at an enormous cost. After this ordeal David realized that the ideal product, in addition to providing mobility support and preventing falls, would be cost effective, comply with all levels of building codes, and install rapidly to minimize disruption. Kell Warshaw, an industrial designer and seasoned inventor as well as David’s nephew had an idea how to do it: extruded and anodized aluminum railing incorporating a continuous channel, and brackets with cam-shaped heads that would clip into the channel with a quarter turn. David offered to invest the seed money to prove the concept if Kell would handle the product development. The simple concept turned out to be not so simple, but about a year later Kell had a prototype that worked flawlessly, looked sharp, and was so novel that he was able obtain a patent for the invention. The result, after four years of further development, is the patented Promenaid continuous handrail system. Promenaid products are the world’s first handrails combining stylish design, strength, speed and versatility that are suitable for any home, business or public building. Available in a range of 5 modern finishes and accessories to complement the any décor, Promenaid meets the requirements of the Americans with Disabilities Act (ADA) and complies with all international residential and commercial standards. 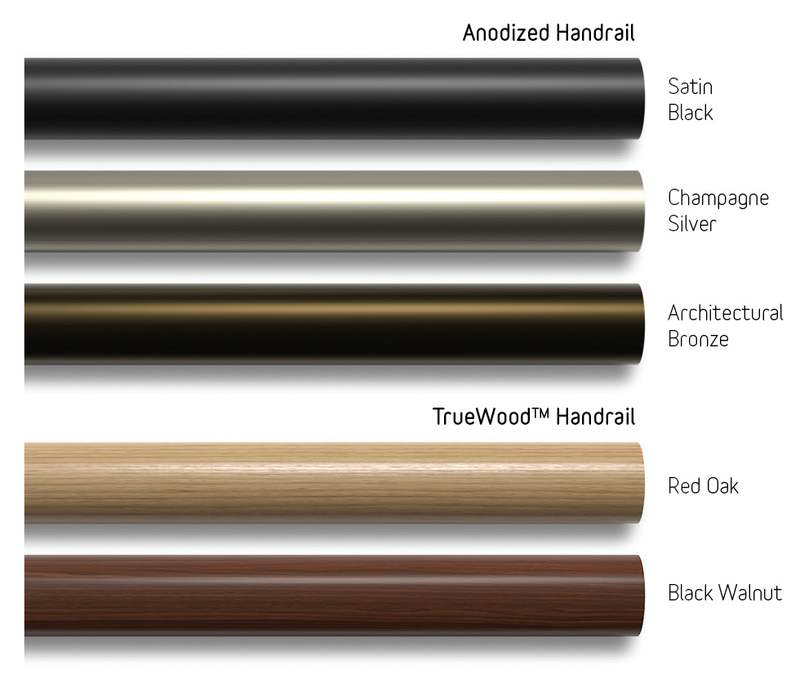 Learn more about our stylish and versatile handrails. We get it. Handrails are not high on the list of things you’re dying to do today. But keeping your family members or clients safe, getting the occupancy permit for your new home, or completing the renovations for opening day of your new business are. The last thing you need is a debate with Mom and Dad over what they’ll do to their house, a rejection from the building inspector, and the hassle and time needed to install them. Imagine a handrail that solves your problems instead of creating new ones. That’s where we come in. We obsess every day over how make a better handrail and make it easier for you. And like you, we love elegant, sublime solutions that simplify life, that give us peace-of-mind, that allow us to spend time doing the things we really love to do. Promenaid is the first and only modular handrail that can be used anywhere – hallways, stairs, bathrooms, walkways, ramps – in dry or wet conditions. Our handrails are available in 5 finishes and matte nickel, antique brass or black satin accessories to complement either a traditional or more modern décor. Promenaid meets the requirements of the Americans with Disabilities Act (ADA) and complies with all international residential and commercial standards. We are proud to manufacture our products in North America. Tens of thousands of our customers have had their “Ahhh, problem solved” moment. Let us help you have yours.